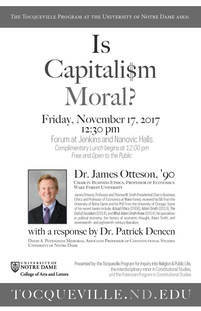 Patrick Deneen, Notre Dame’s Potenziani Associate Professor of Constitutional Studies, will offer a response to Prof. Otteson’s lecture. The lecture, which is free and open to the public, is co-sponsored by the Program of Constitutional Studies. A complementary lunch will be served at noon.